Today is the blog’s first birthday! To celebrate, we drank 3 bottles of Champagne and got sugar wasted off this delicious Champagne Naked Cake. When we realized CWJ was about to be a year old, it was hard to imagine at first. This blog started as a sort of weekend project for us. We mostly just wanted to share the ridiculous foodporn-esque recipes we were making together with our family and friends. When we hit over 10,000 views in only our second month, we had a feeling it was going to turn in to something a little more than that. In our first year, Cooking With Janica has been featured places like Buzzfeed Food (multiple times), Boston Magazine, MSN, Cosmopolitan Italy, Community Table, Foodista, and more. We are thrilled that the food we cook in our little kitchen has reached so many people across the world because of publications and sites these. Before we get to the Naked Champagne Cake recipe, I just wanted to share our personal favorite recipes, as well as a little insight into our most popular posts & top traffic sources from this year. What can we learn from these stats? Well for starters, it’s not necessarily the recipe you spend the most time on or buy the most extravagant ingredients for that becomes the most popular. Our #2 recipe, the marinated avocado, has about four ingredients and takes less than three minutes to make. Who would’ve thought something so simple would go viral on StumbleUpon and get tens of thousands of views in just a few days? While all of our most popular recipes are delicious, Janette and I each have our own favorites. Check out these (mostly) underrated dishes that we thought were the best. Thank you so very much to everyone who has visited the site, made one of our recipes, or even just “liked” our content on social media. We feel very privileged to have all these eyes on us and to be able to make so many new connections. We promise that 2016 will be better and tastier than ever! Naked cakes are a big trend for weddings, but since I’m not having one of those anytime soon, I figured Janica’s birthday was a solid choice. We chose a champagne cake batter, because Janette can never seem to get enough of that sweet, sweet bubbly. The batter is really light and fluffy which I think is nice because it compliments the fruit so well. *This cake was supposed to be three layers, but our third layer had an accident. The recipe below is for a three layer cake. Combine flour, baking powder and salt in a large bowl then set aside. Take a mixing bowl beat butter and sugar for about 5 minutes, until light and fluffy. Add vanilla and beat in the eggs one at a time. Add the flour mixture and champagne in three alternating additions, starting and ending with flour to prevent curdling. Pour your batter into pans and bake 35 minutes or until you can insert a skewer in thecentere and it comes out clean. Set aside to cool completely. Now prepare your frosting. Take a mixing bowl and beat butter for about one minute. Then gradually add sugar, champagne, milk and vanilla and continue beating until smooth and creamy. Once all cakes have cooled you can start to build the Naked Cake. 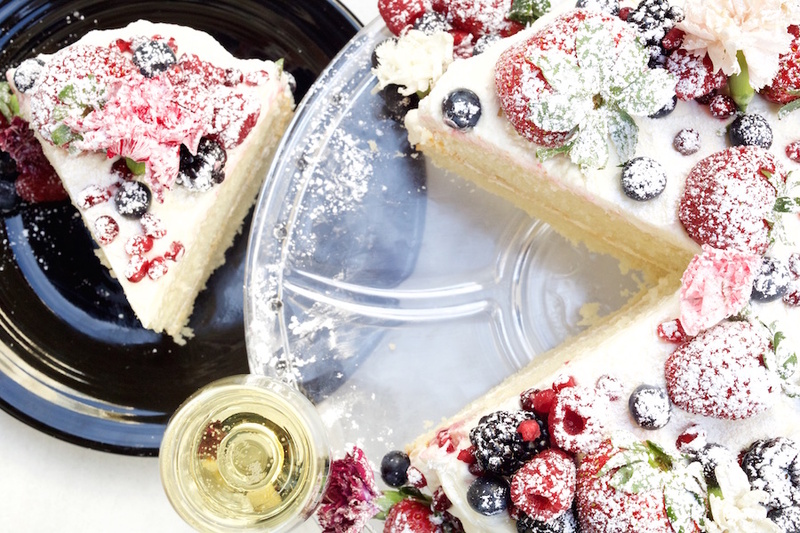 Place your first cake on to a plate or cake stand, top side down. Cover the top with your delicious frosting, then put another cake on top and repeat to make your three layers. Now for the dressing. 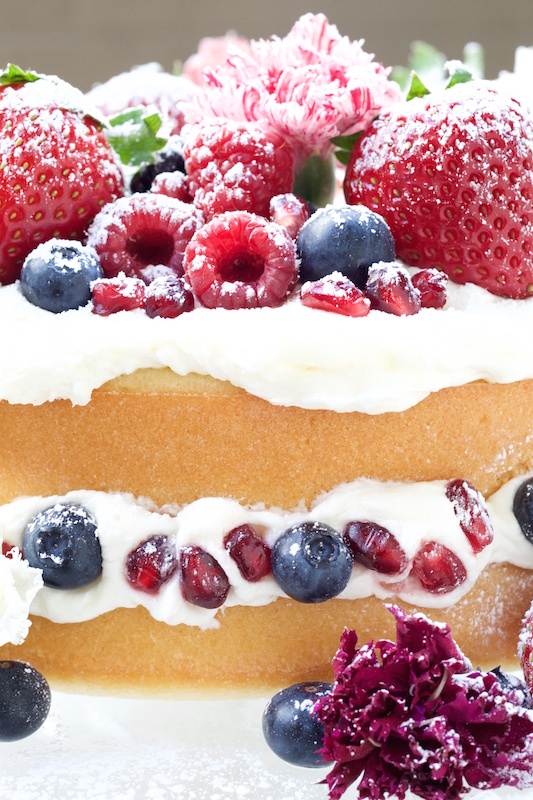 Let your creative juices flow.Place berries and pomegranate jewels randomly on top of the cake and on the buttercream layers. Place a few as decorations also at the base of your chosen stand or plate. Edible and toxic free flowers make a lovely addition. Roses are a favorite of mine and used here. Finally dust with the extra icing sugar. Be careful to not overdo it as you want to appreciate all your berries and flowers. Serve fresh! What kind of champagne did you use? A sweet champagne like Moscato is ideal. How do you get buttercream that is so white? I used Martini & Rossi Spumante . I used wipping cream for frosting. First time making champagne cake, but not the first time, making a cake with egg whites . I expected the cake to be very light, similar to a sponge cake, somewhat aerated. My cake was more like a pound cake. 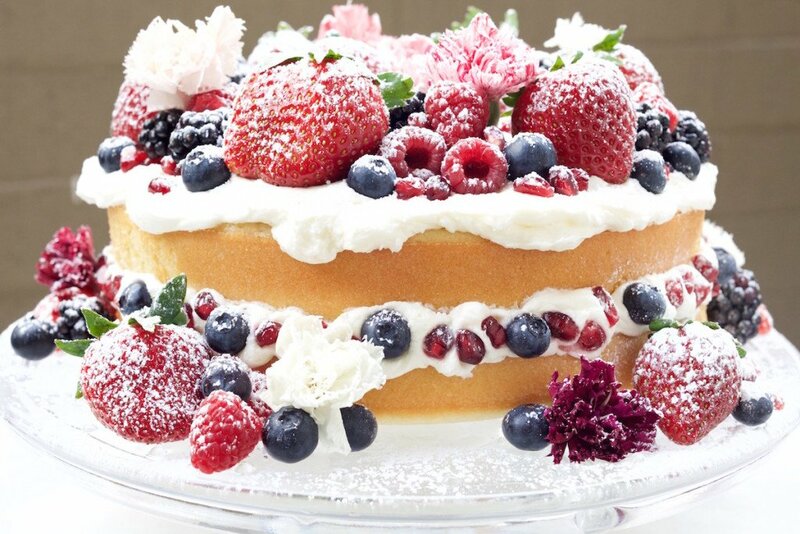 The taste was great, but definable not sponge☹️ I did continue, decorated the cake, I was pleased the way it turned out! It was for a birthday celebration, all the guests enjoyed it! Would like to make it again, what do you think went wrong for that to happen? Or was that the way it should have turned out? Would like to send you a photo of the finished product, what e-mail should I use? I’m glad your cake turned out well, Ivana. This looks amazing. Can it be made the day ahead? I’m assuming it could be if I wait to finish it. But I was hoping to have it done and ready. Thanks. I think you could make it a day ahead, but I would definitely wait to put the berries on until the day of. Otherwise, I think the cake would get soggy. Hi, this cake looks awesome, and I want to make it for my twin sisters birthday. so would it be better to use cake flour? and would i still get batter for 3 9inch pans? I would appreciate your input. So use a sweet champagne? I just dont want to make any mistakes . thank you for this recipe.